I find it a gratifying to go to a little effort and receive tasty results. I also find it a good exercise to distract myself when I’m a bit stressed (and I happily tell myself I’m doing my family a service by providing baking where I know exactly the contents!) 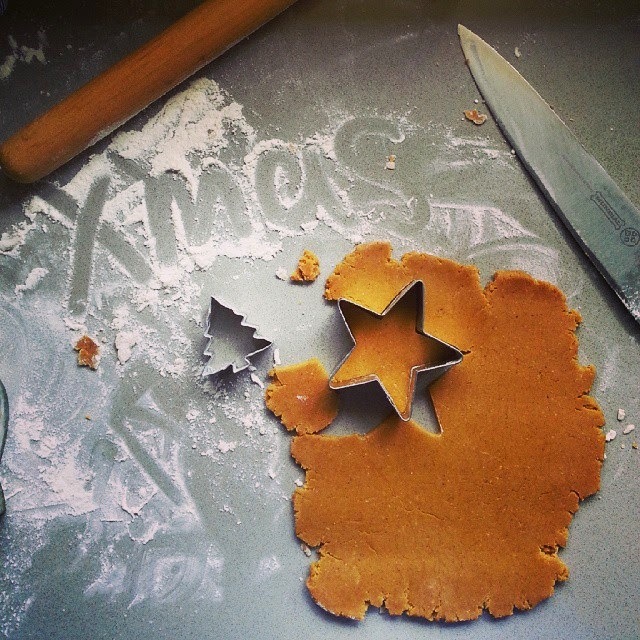 and with the hectic lead in to Christmas, I enjoy a bit of Christmas baking. My German grandmother, whom I adored, used to bake hundreds and hundreds of spiced, crispy biscuits called Braune Kuchen (which sadly translates to “Brown Cakes” which isn’t very exotic sounding at all) for Christmas and give tins of them to those near and dear to her on Christmas Eve. My grandmother once told me the recipe and I quickly noted her instructions, which were something like a pound of this, pound of that, a pinch of this and maybe a dash of milk if the dough is too dry, or a sprinkle of flour if it’s too wet. That’s it. No method, just a list of ingredients. I’ve made her so called recipe with good results, but have come to realise it’s the combination of spices that evoke the Christmas memories for me. So I decided to tart up my usual gingerbread men recipe with a few extra spices and am quite pleased with the results of my version of this family favourite. P.S. I make a double batch and freeze half the dough, so I can bake the second batch at my convenience. Cream butter, sugar and treacle til light and fluffy then mix in the egg. Stir in the sifted dry ingredients, and then knead lightly into a ball. Roll dough flat on a lightly floured surface to about 3mm thick. 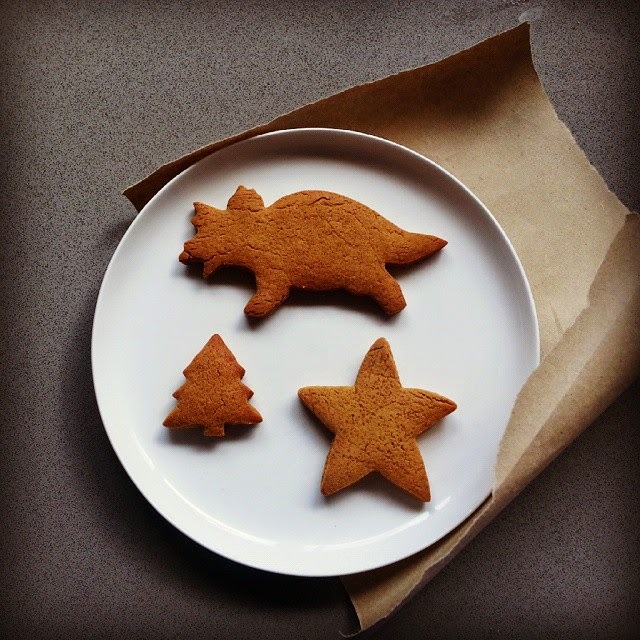 Use your favourite cookie cutters to make your shapes (this year we have a star, tree and Christmas dinosaur!). Place on a lined baking tray and bake in the oven at 180c for 10-12 minutes (the cooking time is a bit contentious in our family… soft or crisp? Either way is delicious). I hope these Christmas biscuits become a Christmas tradition for your family too.